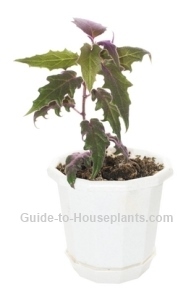 Purple Passion Plant is known for its finely serrated green leaves, densely covered with purple hairs. The leaf undersides and stems are also hairy, giving the whole plant an iridescent, velvety sheen. Pinch off the yellow-orange flowers that appear in spring. They're not only ugly, they have a bad odor. Plants often flower after they're a year old. You may notice that your plant will begin to decline after flowering. That's why it's a good idea to propagate cuttings to replace your plant. It's fast-growing, so you'll have a big, lush-looking new house plant in no time. Careful with that water! Avoid getting the velvety leaves wet. Drops of water will cause dark spots on the leaves and they won't come off. If the leaves need to be cleaned, brush them gently with a soft, dry brush, such as a small paintbrush. Shed some light. Providing bright light will enhance the color of this stunning foliage plant. If the leaves are more green than purple, move the plant to a sunnier spot. 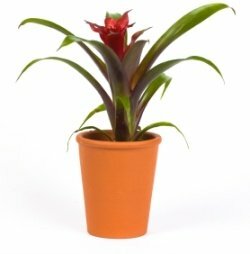 Keep it out of harsh, direct sunlight, though, because its leaves will scorch. Pinch it back. Pinching off the stem tips is the way to make it branch out for a fuller, bushier plant. Don't toss out those stem tip cuttings, either. They'll root easily, giving you more beautiful plants. Water regularly. Purple Passion Plant is a "fainter" if the soil is allowed to dry out. However, you can revive it quickly with a thorough watering. Aim to keep the soil evenly moist during the growing season, slightly drier in winter. This popular plant may be labeled by any of these common names: Purple Passion Plant, Purple Passion Vine or Velvet Plant. Some have an upright growing habit, others are vining. If you're looking for an upright form of Purple Passion, look for Gynura aurantiaca. Want the trailing vine type for a hanging basket? Gynura sarmentosa has twining stems that can be trained to grow up a trellis or left to trail. 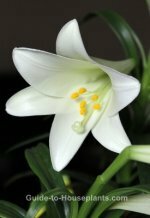 Height: Upright forms grow to 2 ft (60 cm) tall. Trailing forms can grow to 4 ft (1.2 m) long. Light: Bright indirect light. Some direct morning sun is fine, but avoid strong summer sun which can scorch its leaves. Water: Keep the soil evenly moist spring through fall. Water less in winter, keeping the plant barely moist. When watering, take care not to get water drops on the leaves which can damage them. Humidity: Moderate to high. If the relative humidity drops below 50%, use a pebble tray or humidifier. Don't mist this plant because the hairs trap moisture that may cause the leaves to rot. Propagation: Take 3-4 in (7.5-10 cm) stem tip cuttings in spring or early summer. Cut just below a node -- the place where a leaf is attached to a stem. Dip cut ends in hormone rooting powder and place in moist peat moss or perlite. Enclose in a clear, plastic bag or cloche for the first couple weeks to hold in moisture.